We are a small, family owned business based in Northport, Michigan offering a unique combination of skills and services. We specialize in collector car restorations and custom fabrication, putting artistic skills and over forty years of experience in body work to use daily. We like to think that we are helping preserve a tradition by helping our clients preserve a family heirloom for the next generation. Darin Irvine is a third generation craftsman in body work, following in the footsteps of his father and grandfather. Based in the tiny village of Northport, Michigan, his work has garnered national attention. He is an unique combination of artist and craftsman, using his talent for design in conjunction with his metal working skills to achieve outstanding results. Darin's skills are complemented by those of his wife and business manager, Lynelle Wilcox-Irvine. Her experience from many years of working abroad for a multinational company has proved surprisingly applicable to the world of a small business owner. Together we run a pretty tight ship. 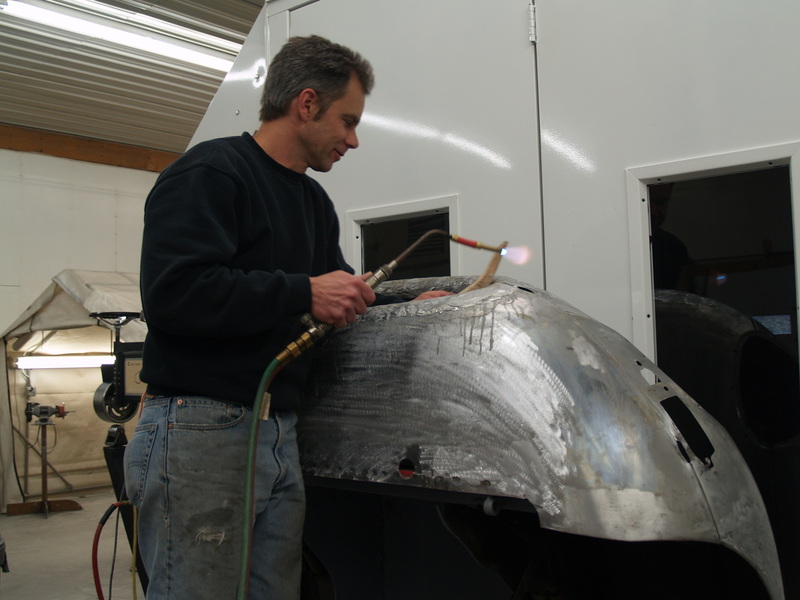 After working with his father for over 20 years on a combination of collision and restoration projects, Darin founded this business in 2004 so that he could focus on collector car restorations. At the time, he viewed it as an experiment, and threw himself into the wonderful world of the self-employed. He has restored and re-finished a wide variety of cars including Jaguars, Model As, Mustangs, Firebirds, Porsches, Austin Healeys, Cadillacs, Mercedes, an Isetta, a couple of pick ups and a show tractor. He has made aluminum bodies for Stanley Steamers. He has designed, engineered and fabricated a one-off all aluminum bodied 550 Spyder and continues to amaze visitors to his shop on a daily basis.